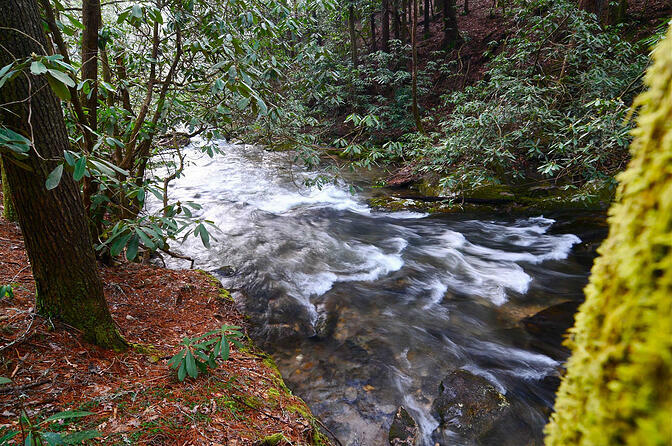 The setting of this beautiful stream is nestled in the hardwoods as it meanders its way threw the mountainous landscape. 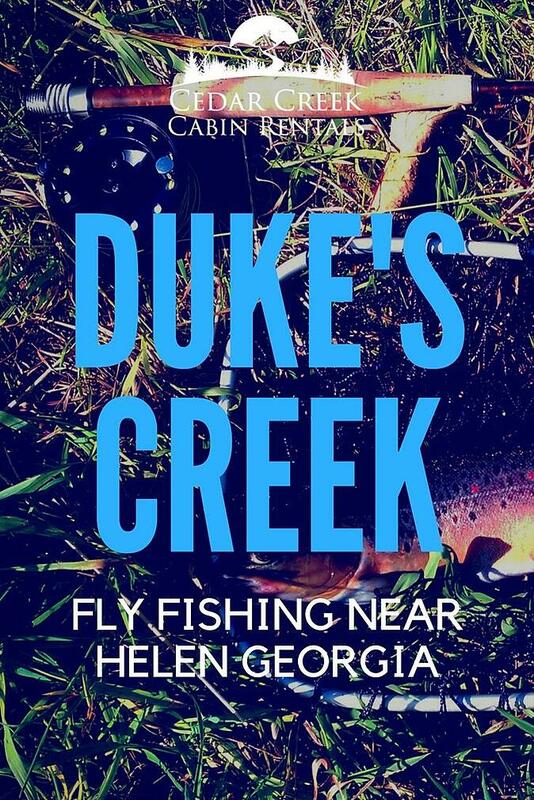 It's proximity to Helen Georgia provides ample opportunity for traditional lodging, but at the same time you get the experience of fly fishing in a wilderness setting. Much of this stream offers large deep pools with some occasional fast water. Through my experience fishing Dukes Creek I've noticed the fish do not bite as well after a rain storm. Others may suggest that the additional flow actually stirs up the insect life and brings more food to fish waiting down stream. I am sure this comes directly from my sight casting mentality. The ability to actually see the fish rise to the fly is what I live for when it comes to fly fishing. Anyways the stream does have many sections of flat water for dry fly fishing and nice long pools to drift a nymph through. The State has done a great job managing this stream by making sure the appropriate cover and eddies are created by placing logs and boulders in the right position. Even though this is an incredibly beautiful stream don't let it fool you, these fish are keen when it comes to a short leader and a sloppy cast. If you have not had the opportunity to fish for trout that know when you are coming and can sense your presence before your arrival then you're traveling to the right place. Smithgal Woods is the WMA (Wildlife Management Area) where this stream flows and the fish have not grown large here for just any reason. It's because they're selective. When you're fishing a hatch, tie on an extra long leader or be completely out of the fishes peripheral vision. It helps tremendously to have another person fishing with you to be the sighter while you make delicate casts in the direction of where the fish is feeding. If you like to hunt, this type of fishing is a fantastic tandem because it demands a sight and stalk approach. Much like an archer has to make a silent and selective shot hunting, a fly caster needs to target these old bruisers with a delicate and exact cast. If there is a significant hatch happening make sure to bring fly patterns that look different from the main hatch. Meaning, if it is a pale morning dun hatch then make sure you try a dry fly that has only one wing and looks as if it has been injured. Many times these large trout will focus on insects that have a deformity. How incredible is a trout's eyesight? They are extremely attentive to the flies that are floating down their feeding channel. And the fish can be so selective on one type of insect that they do not even waver when another nice meal passes. Understanding the details of the flies, one must cast to be successful, brings me to another critical point. Tie your own creative replications. If you know the type of insects that will hatch at any given day this will give you the opportunity to fine tune your patterns to have noticeable differences in their structure. This science of fly tying will give you the edge you need to turn a trout's eye from the myriad of flies floating down the stream to your crippled imitations. I have fished all over the world and always take the same precautions when taking a fishing trip. Even at Dukes creek I would make sure to dress for the occasion. If it is a warm summer day there is no way I would even pack my waders This stream is fifteen feet wide at max so standing in the stream is only necessary when trying to fish the headwaters of a pool. More importantly the color of your clothing makes a big difference when crawling through the bushes and into casting position for fish. Don't be afraid to wear some camouflage up top and breathable earth tone pants down below. Also bring your assortment of flies so that you can always go back and get them in your vehicle. I would even suggest having your vice and tying materials if you get in a bind. Have you made the time to tie your flies and practice your casting? How Do I Get To Duke's Creek? Drive north to the Smithgall Woods State Park. We recommend you plug in the coordinates 34.7016600, -83.7891200 into Google Maps. This will take you right to the trail head of Duke's Creek. Also, while you're in the area, don't forget to check out Raven Cliff Falls for a fun and beautiful hike. Overall make sure to have a great time and we hope you select Cedar Creek Cabin Rental. Bring a friend or the person you're mentoring to show the ropes. Believe me, they'll never forget it. Click here to view our cabins. 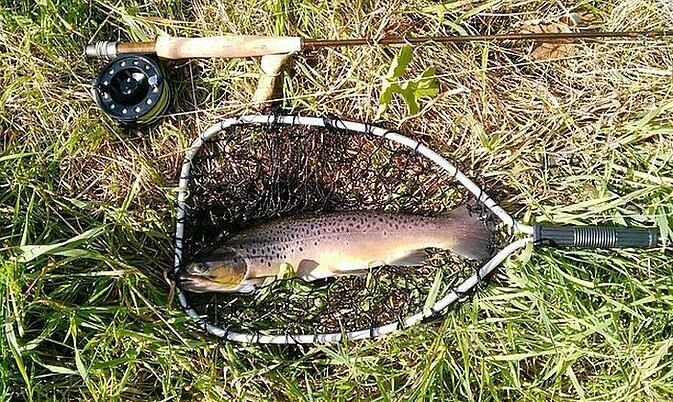 Whether you're looking to buy tackle, flies, or a fishing license, these great local organizations can help serve your fly fishing requirements.